The overall package - money, craftsmanship and sound. Superb. Tuners on the stiff side. This Admira F4 has a stunning design. There is a bright red coloured maple wood nestled between dark maple binding, which is perhaps a little reference to the traditional red of the traje de flamenca (the outfit worn by the flamenco dancer). It circumnavigates the guitar providing a strong first impression. The Admira F4 has a light grain spruce top and is finished with a fine gloss. While solid rosewood back and sides generally give more depth to the sound of flamenco guitars, this model sports flamed maple back and sides and the results are just as effective. Rasgueado technique shows off some impressive lower end tones and Apoyando gives you just the right amount of attack in the upper register to take your solos to the extreme. The set-up of the fingerboard and action allow for a fast pace, like the Alhambra. Harmonics are loud and crisp and there’s plenty of room for volume in the upper register. A possible reason for this is that this Admira F4 uses the traditional Spanish heel at the neck joint. No glue is used here. The joint is carefully constructed out of mahogany - the details of which can be seen in the changing direction of the grain and the delicate piece of rosewood capping it off. A rosewood strip along the reverse of the neck provides extra support for the left hand too. There is one key missing feature on this model though: golpeadores. Without which, and in the hands of a professional flamenco player, the soundboard would become mostly obliterated in a small space of time. This is an oversight to say the least. 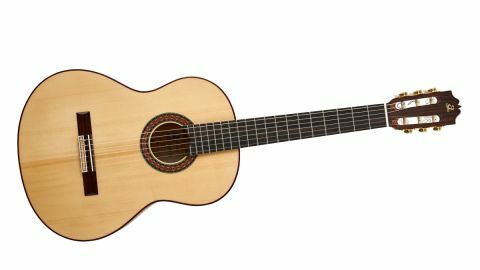 The Admira F4 is geared more for the established guitarist crossing over into the world of flamenco, as there’s potential for a dynamic range of tone in the right hand.